It was in 1933 that the São Paulo Plastics and Chemical Workers Union was created in the traditional São Paulo district of Brás. In 1954, however, the organization was divided into two different unions: one representing the chemical industry workers and the other representing the plastics industry workers. These two organizations were severely affected by the repressive forces of the military dictatorship that overtook the country in 1964 and subsequent years. Their democratically elected boards of directors were brutally replaced by administrative officers from the then-called Ministry of Labor and Social Security, and could only reclaim their freedom in 1982. The chemical and plastics unions’ reunification took place in 1994, after the redemocratization of the country. They were now under the banner of the Unified Workers’ Central (CUT), a symbol of the “new Brazilian unionism”. It is fair to say, then, that the São Paulo Plastics and Chemical Workers Union was at the root of this innovative movement. The São Paulo Plastics and Chemical Workers Union’s field of membership encompasses the main factories and administrative areas of both Brazilian and multinational companies in the chemical, pharmaceutical, fertilizer, cosmetics, and processed plastics, fields. The Union’s current headquarters is located in the São Paulo downtown neighborhood of Liberdade. There are five other regional offices in its area of jurisdiction: Santo Amaro, São Miguel, and Lapa (in São Paulo City); Taboão da Serra and Caieiras (in the Greater São Paulo area). There are, also, two summer camps and a country club for members and their families. Currently, the Union represents about 80,000 workers in more than 3,000 companies. Their main fields of activity are: plastics, pharmaceuticals, chemicals, and cosmetics. There are about 30,000 women working in the sector, most of them at companies in the cosmetic and pharmaceutical industries, in which they represent 45% and 56%, respectively, of the workforce. Due to the fact that most companies base their administrative departments in São Paulo, office workers have significantly increased their share of the total number of workers the Union represents. These figures illustrate why the São Paulo Plastics and Chemical Workers Union is the largest of its kind in Latin America and one of the most important organizations affiliated to entities such as the aforementioned CUT; the São Paulo Chemical Industry Workers Federation (Fetquim); the CUT National Confederation of the Chemical Industry (CNQ-CUT); and the international trade union organization IndustriAll. The Union has about 20,000 members, of whom 61% are men and 39% women. The industries with the largest number of unionized women are the cosmetic and pharmaceutical industries. In the 2015-2019 term, the Union’s upper management is composed by 43 elected members, distributed among nine secretariats: Coordenação Política Geral (General Political Coordination); Formação Sindical (Union-Related Education); Mulheres Trabalhadoras (Women Workers); Saúde dos Trabalhadores e Meio Ambiente (Workers’ Health & Environmental Affairs); Assuntos Jurídicos (Legal Affairs); Cultura (Culture); Imprensa (Media & PR); Administração e Finanças (Administration & Finance), and Secretaria-Geral e de Organização de Base (Grassroots Organizing & General Secretariat). One of the greatest victories for the advancement of Brazilian society was the election of a woman as president of the country. The president has been a most valuable ally of the Brazilian women in the struggle for greater conquests. However, access to the job market still constitutes a major obstacle in the women’s path to equality. Although they represent 51% of the country’s population, only 43% of the women are effectively in the job market, a disparity cause both by difficulties of access associated with discriminatory practices, and by objective difficulties such as lack of public day care centers, for example. In the workplace, women face discrimination on a daily basis, and that is a direct violation of a fundamental human right. Moreover, their salaries tend to be substantially less than those of men. That is one of the most persistent root causes of inequality between men and women in Brazil. The São Paulo Plastics and Chemical Workers Union fights against discriminatory practices incessantly. The women chemical workers are organized by the Bureau of the Worker Women, and the main causes they fight for are equal opportunity, public day care centers, extended maternity leave, and the end of generalized violence against women. Many young Brazilians do not have jobs or adequate conditions for professional activity. Although the country has created new jobs, and started to expand investments in professional training for the young, the fact remains that access to decent jobs is still uncertain for this age group. With a working population comprised mostly of young people between the ages of 15 and 34, the present situation represents and enormous challenge to Brazilian society. The Union has as one of its top priorities the organization of the working youth, encouraging membership and participation in courses, conferences and activities promoted in collaboration with the Unified Workers’ Central. Nowadays, about 30% of the chemical workers have not yet reached the age of 30. At the Union, young workers are organized by a group made of union leaders and grassroots workers. The São Paulo Plastics and Chemical Workers Union maintains an intensive training program designed according to the methodological legacy of renowned Brazilian educator Paulo Freire, who argued throughout his extensive work that knowledge is socially constructed, and based on the experiences of the working class. According to Freire, knowledge is essentially political, and should be used as a tool for understanding and transforming social relations. This methodology was shaped into an annual cycle of studies and training, with different activities – especially courses and seminars – addressing topics such as the workers’ union (theory and practice); organization in the workplace; unionization; labor rights; youth and women organization; workers’ health; and others. It is, in short, a training program for activists and union leaders, deeply related to the Union’s strategy of political organization. According to the Brazilian labor legislation (articles 611-625 of the Consolidation of Labor Laws – CLT, Decree/Law No. 5.452, of May 1, 1943), employers and employees must negotiate collectively once a year. The São Paulo Plastics and Chemical Workers Union is responsible for two annual collective bargaining: one covering only the pharmaceutical industry, effective from April to April (from one year to the next), and another covering the chemical, cosmetics and plastics industries, effective from November to November. Each agreement usually contains about 90 clauses that address economic, social, health, gender, and union organization issues, plus additional and voluntary clauses. Each year, the economic clauses recover the lost purchasing power of wages, while at the same time achieving real gains over inflation. Social clauses may remain effective for up to two years. The agreements also guarantee participation in the profits and enterprise results for the workers in the industry. It is noteworthy, however, that for the largest companies such payment is negotiated on a plant-to-plant basis. 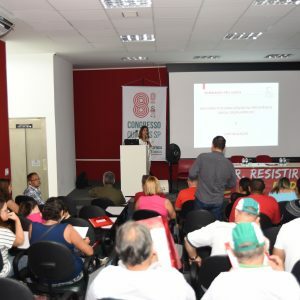 One of the most difficult challenges the São Paulo Plastics and Chemical Workers Union has to face are management practices that promote worker turnover rates of at around 30% per year, leading to persistently lower wages. It is estimated that around 30% of the chemical industry workers are actually employed by outsourced service providers. The extensive use of outsourcing reduces the number of workers represented by the Union, weakening the fight against poor working conditions and against the erosion of labor rights. Moral harassment and repetitive strain injuries (RSIs) are two of the worst factors causing health problems in the workplace. Harassment causes depression and other mental illnesses, and repetitive strain injuries caused by poor organization of work have become quite common among workers in the chemical sector. Brazilian labor legislation does not recognize the right to concerted union activity in the workplace – such as factory committees, for example. A major challenge to the Union is therefore to organize workers in their workplaces so that they can fight to improve their work situation. Another important fight is for the reduction of working hours, to 40 hours per week. Employees in the pharmaceutical industry acquired this benefit in a previous collective bargaining agreement. Our challenge is to extend this achievement to workers in the chemical, processed plastics, and cosmetics industries. Finally, to improve and expand worker networks in multinational companies is another major challenge for the Union. To date, there are four consolidated worker networks, but there are many other possibilities to strengthen international cooperation.